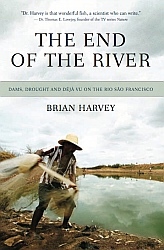 The End of the River (2008) was my first trade book. year", published in Canada and the U.S.
effects, and with the memorable luminescence of a story well told." hotels, Amazonian outposts and Brazil's raucous Carnaval." the planet's living waters. A great way to open peoples' eyes." Brian Harvey is that rare fish, a scientist who can write.” —Dr.